Elephant ears on gingham towels. State fairs and carnivals are known for their tasty, high-calorie snacks -- and elephant ears fit this description. 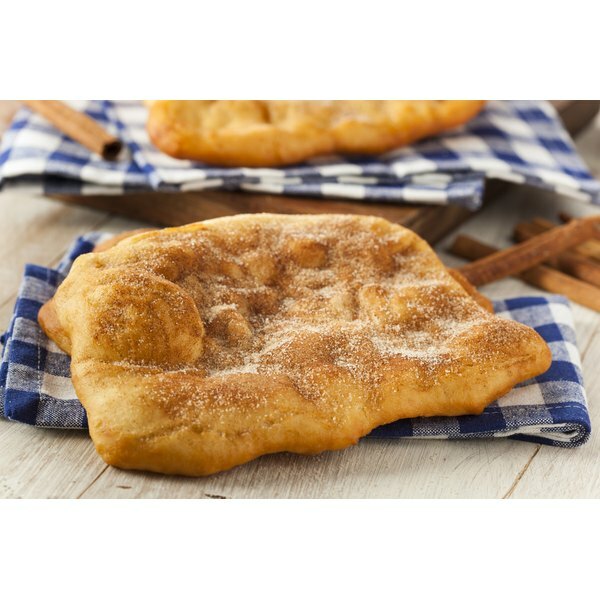 Also known as fried dough, or in Canada as a beaver tail, this treat consists of deep-fried dough sprinkled with sugar, cinnamon and even fruit or chocolate. Although consuming an elephant ear might make your visit to the state fair complete, be wary of the item's high caloric content. Elephant ears get their name from their general shape, which is large, round and flat, much in the same manner as an actual elephant's ear. The exact caloric content of this product ranges by manufacturer and according to the toppings you add. A 2011 "Time" magazine article ranking the 10 best foods found at state fairs reports that elephant ears contain roughly 300 to 500 calories. Part of this high caloric value is due to the fact that they're deep fried. If you make your own elephant ears or buy them uncooked from a bakery, you can bake rather than deep fry them, reducing the calorie count.